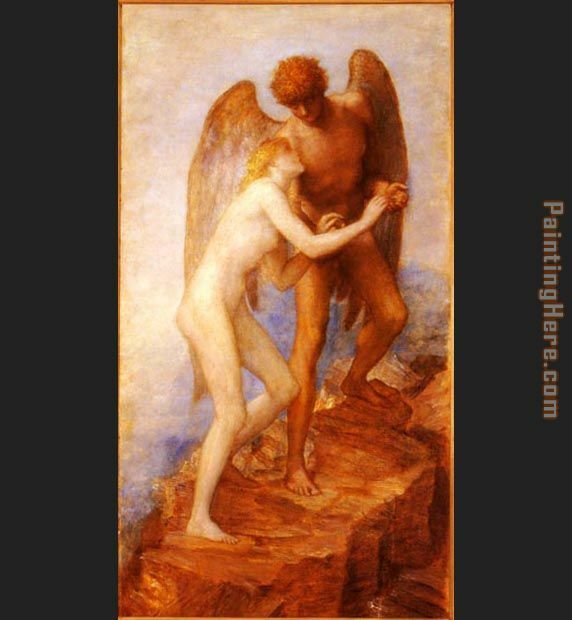 Love and Life caption: "Love, strong in his immortal youth, leads Life, a slight female figure, along the steep uphill path; with his broad wings he shelters her, that the winds of heaven may not visit her too roughly. Violets spring where Love has trod, and as they ascend to the mountain top the air becomes more and more golden. The implication is that, without the aid of Divine Love, fragile Human Life could not have power to ascend the steep path upward. First exhibited at the Grosvenor Gallery in 1885. Companion picture to 'Love and Death,' and 'Love Triumphant. '"This painting bears a strong resemblance to works by Burne-Jones Beautiful, original hand-painted artwork in your home. Interpreted paintings based on the masters' works of George Frederick Watts.This Love And Life needs about 14 - 16days for production by a talented artist. If you're not happy with George Frederick Watts Love And Life that you made on PaintingHere.com, for any reason, you can return it to us within 50 days of the order date. As soon as it arrives, we'll issue a full refund for the entire purchase price. Please note - PaintingHere.com does not reimburse the outgoing or return shipping charges unless the return is due to a defect in quality. If you want to purchase museum quality Love And Life at discount price, why not give us a try? You will save a lot more! This George Frederick Watts Love And Life needs 14 -18 days for production time frame. We ship all over the world. We can provide Love And Life Painting stretched canvas and large framed art.